Q. What's is the difference between Taxis and Cabs? A. Public Rank Taxis operate mainly from Taxi Ranks, individual drivers can take bookings and JTDA members are radio linked so they can liaise with other drivers to see if someone is available to take a booking. The fares are controlled by the States of Jersey (DVS) department and the Taximeters are sealed, this makes Public Rank Taxis the cheapest in the island. Cabs drivers on the other hand work for Private Hire Cab companies who run depots and employ operators, there overheads are higher and this is why they charge more to cover those expenses. They take mainly telephone bookings and provide a door to door service, the regulations were changed to allow them to pick up hailed fares off the street, but not within 100 yards of a Taxi Rank, they are also supposed to charge Public Rank Taxi fares when doing so. Beware some Cabs drivers are known to pick up near Public Taxi Ranks and illegally tout for business, they have also been known to keep their meters set to Private Hire tariffs, as some do not bother to switch the meters over to the cheaper Public Rank Taxi tariffs as a conditional rule set by the DVS if they pick up hailed fares off the street. Q. How do I tell the difference between Public Rank Taxis and Private Hire Taxicabs? A. The best way to tell if the Taxi you are getting into is a Public Rank Taxi is to simply check the roof sign, if it say 'TAXI' and 'Controlled Taxi Fares' as shown in the picture opposite, you can rest assured that it is a Public Rank Taxi and the fare charged will then be the cheaper controlled fare. On the other-hand if the roof sign is white and says the name of a company or just a mobile number with the words 'RESTRICTED TAXICAB' then this is a Private Hire Cab. Q. Why are Taxis in Jersey so much more expensive than Taxis anywhere else in the UK ? A. This simply is not true and a total misconception, while we accept that certain areas in the UK are cheaper, those places are more than likely to be northern towns and cities. On the 2017 UK National league table of fares charged for a 2 mile journey 'Jersey Public Rank Taxis' are placed in a group of 9 other councils that charge £7.00 for a 2 mile journey. However this league table does not take into consideration that there are extras charged by most taxis throughout the UK for extra passengers carried over 1 and also for luggage etc. Example Isle of Man charge 50p per extra passenger and another 50p per bag carried in the trunk of the vehicle, these extras have now been removed from all Jersey Public Rank Taxis so a true comparison on fares charged would actually see us placed much further down on this league table...Yet Jersey is one of the most expensive places to live in the British isles with a much higher cost of living. Q. Why don't Taxis stop sometimes, I tried hailing them down and there was no one else in the Taxi? A. Taxi drivers will stop for hailed fares, but only when they are not busy, this basically means that customers who are waiting at the Taxi Ranks will always be the main priority for Taxi drivers, as it would not be fair to any of our customers who have made their way to the Taxi Rank and perhaps waited patiently during a busy period to see us picking up in favour of others who have simply walked away from the Rank because they don't want to join a queue. 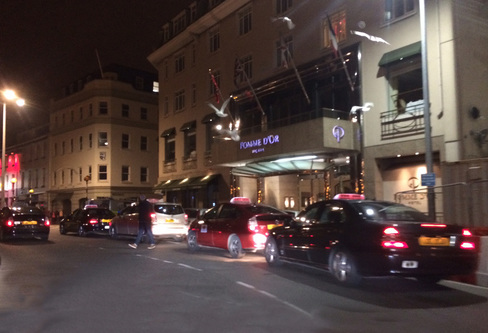 Getting into Private Hire Taxicabs like the ones in this picture who are illegally parked and touting for business outside the Pomme D'or Hotel is one reason why you may end up paying a lot more for the same journey than you would if you used a Public Rank Taxi. Yet no more than 50 metres away from this hotel is the Public Taxi Rank at the Weighbridge. Q. Why was the fare charged different for the same journey from the day before? A. There could be many reasons why this has happened, it could simply be a time difference, if you travelled after 7am to 11pm you would have been on the cheaper day tariff 1. Perhaps there were delays with rush hour traffic or road works and diversions or a detour to drop off another passenger would also add more to the fare. Please read our page on Tariff Charges. 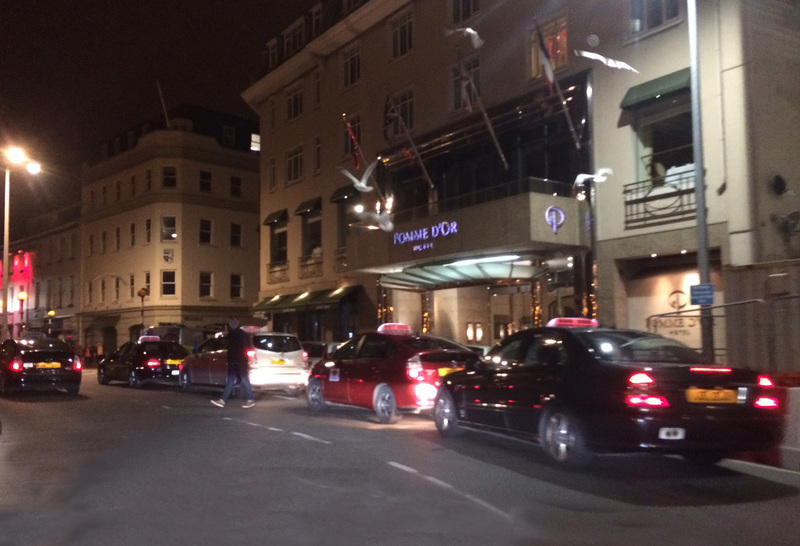 Sometimes customers just get into Private Hire Taxicabs parked outside places like the Pomme D'or Hotel, Mimosa night club, Chambers and in Bereford Street, as explained above most of these PH drivers leave their meters on Private Hire tariffs which are set much higher than Public Rank Taxis fares. Q. Why Aren't there more Taxis when your customers are waiting one? A. Like a lot of businesses we have our busy times and some very quiet periods and it's not always possible to anticipate those times, and example a flight comes in with over 100 passengers on board and only two Taxis might be hired from the airport, another day the same amount of people on another flight might use up 20 or more Taxis!. We know we have really busy times when the night-clubs close around 2am on a Friday and Saturday night, but we usually have the streets cleared between 3 and 3:30am, obviously it's difficult to cope with that amount of people leaving these clubs at the same time especially if they all head straight for the Taxi Rank. The same happens in towns and cities all over the UK, so do we put another 50 taxis on the roads just for one hour two nights a week? it would not make economical sense and no person would want to work or invest in an industry that expects them to pay out a lot of money for a suitable vehicle and to buy equipment like communication radios etc, and then other overheads like depot rents and fuel and public liability insurance to buy, just to help out for only two hours per week during busy times!. This is the same for any other business and unfortunately it's a fact of life that we have to wait sometimes for flights, boats, trains and buses at the doctors or at the banks and shops during busy periods. Q. Why won't you take more people in your vehicles as we don't mind squeezing up with our friends in the back? A. All Taxicabs vehicles are licenced by the DVS to carry a certain amount of people for safety reasons, the number the driver is allowed to carry is put on the side of each vehicle and the driver must abide by those regulations or he could end up being suspended from driving and facing a fine. Not only this but the drivers public liability insurance would be void in the case of an accident, so NO responsible driver would ever put his passengers at risk or break the law just to squeeze in that extra passenger as they could end up losing their Taxicab licence, their job and livelihood. JTDA Rules & Regulations of Hire. Q. How do I apply to get a Taxi badge and my own PSV plate? A. To apply to become a Taxicab driver today you will need to obtain a badge first, you must already hold a Jersey driving licence which includes category B. You then complete a disclosure and barring service (DBS) check, this is passed on to the Police Headquarters, a record check will then be done to find out if you have any criminal convictions including motoring offences, the results are forwarded to the DVS, then you will be required to attend a formal briefing at the DVS department. A practical driving test will be set, and you will need to take some formal driving lessons with an approved driving instructor to get rid of any bad driving habits that you may have picked up!. Then you have to pass an island knowledge test, and to prepare for this you will need: the highway code book, the Jersey almanac, a good map of Jersey, also a good knowledge of where housing estates are, Hotels, Guesthouses, Nursing Homes, Hospitals, Schools, Public houses, Restaurants, Nightclubs and Social Clubs, Town streets, Campsites, Recreation and sports areas, Places of interest, Crossroads, Junctions and districts, Parish halls, Churches, and the shortest practical routes between the locations given. You will also have to fill in the names of the 12 parishes on an outline map of Jersey. Section 2 Is a multiple choice questionnaire covering aspects of the law pertaining to PSV, including knowledge of vehicle maintenance that a driver would be expected to be aware of, the highway code and general public service vehicle matters.